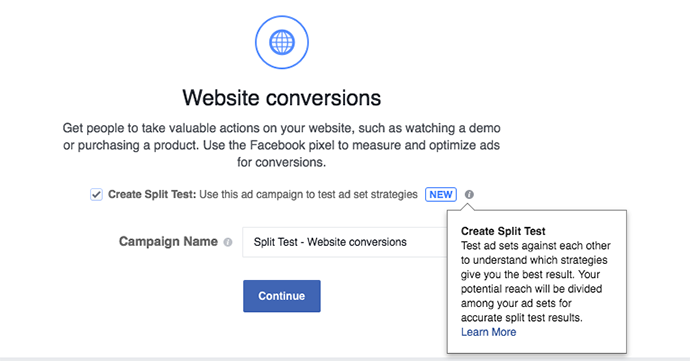 Experienced advertisers understand that extensive Facebook ad split testing is necessary to uncover what works and what doesn’t. That means experimenting with lots of things that don’t work before finding what does. One example of this is split testing. Split testing allows an advertiser to experiment with two or more versions of a single variable (like two different audiences) that would see the same ad. 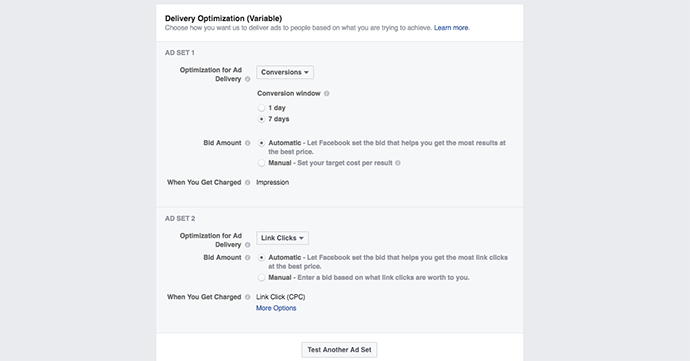 Up until now, split testing on Facebook has been somewhat complicated. Yes, you could create multiple ad sets for different audiences or optimizations and show each the same ad creative. But advertisers could not prevent overlap — a single user seeing the same ad in each ad set. And it was also difficult to assure that different ads were shown equally. 1. Facebook separates your audience randomly to assure that there won’t be overlap. 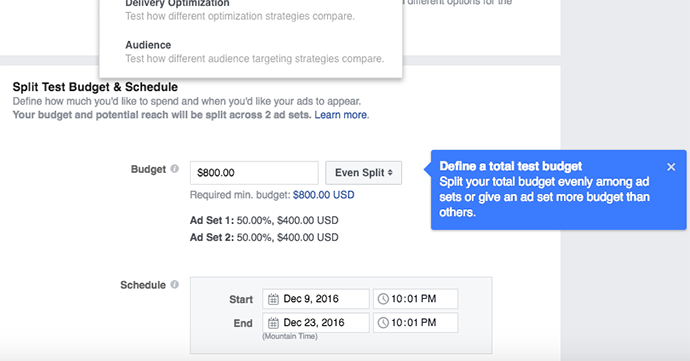 Each ad within the ad set will then be shown equally (or weighted as you determine) to each ad set. 2. Each ad set within the split test is identical, other than the testing variable. 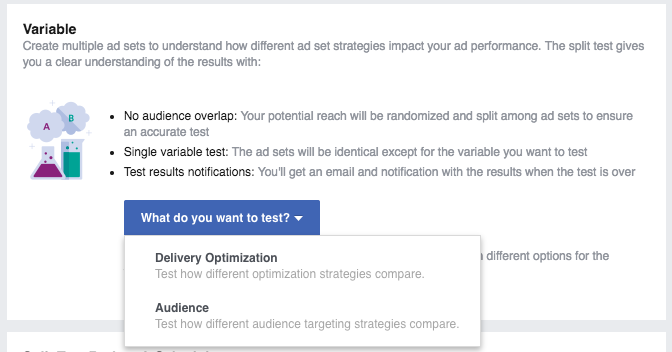 The variable differentiating the two ad sets can be audience or optimization (it also appears that placement will be a variable, though I don’t have this yet). You can test one variable at a time and include up to three variations. 3. Split testing is available to most advertisers who have a Business Manager account within either the ad create tool or Power Editor. 4. Split testing is currently only available for the Website Conversions, Mobile App Installs and Lead Generation campaign objectives. 5. 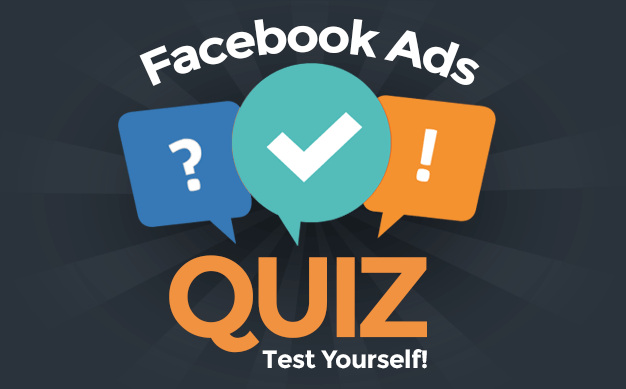 In most cases, you will split test two different ad sets, but you can test up to three. 6. When testing the “Audience” variable, advertisers must currently select from saved audiences. 8. 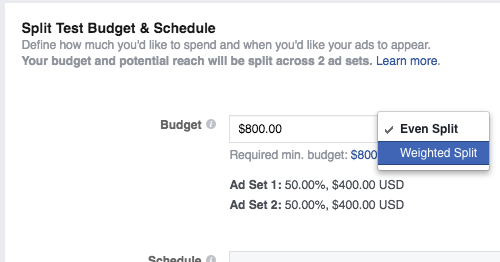 Facebook establishes a minimum budget required to get sufficient data to execute a test. That budget will be split equally between ad sets. 9. Facebook recommends schedules between three and 14 days for best results, though there aren’t any requirements here. 10. When the test is complete, you’ll be notified within Ads Manager and receive the results via email. The “winner” of the split test will be the ad set with the lowest cost per outcome. As mentioned above, a third variable option will be Placement, however I don’t currently have that. You’ll simply want to make one variation between the two ad sets. As mentioned above, it could be delivery and optimization (optimizing for Website Conversions vs. Link Clicks), conversion window (1 day vs. 7 days) or bid type (automatic vs. manual). By default, you’ll create two ad sets, but there is a button at the bottom of the variable area to “Test Another Ad Set.” As I type this, you can create up to three. Yeah, this is kind of annoying. Not sure why you need to select a saved audience instead of simply entering in your audiences. But if you haven’t created the saved audiences you want to test, you’ll need to do that first. 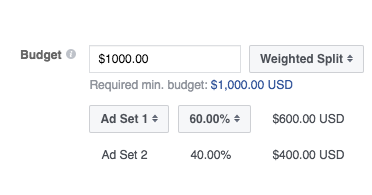 When using the weighted method, you can focus more of your budget on one of the ad sets by choosing the percentage of budget to be used on Ad Set 1. Note that when using this method, the minimum budget tends to go up. This makes sense to make sure you get enough of a sample size in the ad set getting less budget. You’ll then need to create your ad. This single ad will be used across the ad sets in your split test. Always avoid combining multiple audiences within the same ad set. 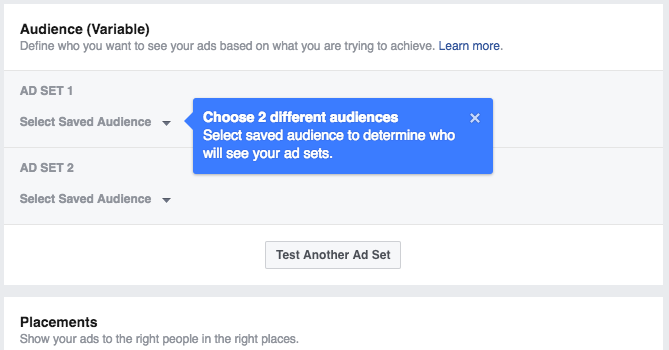 This new split testing feature will help you isolate which audience is most effective. The truth: There is no universal answer. You need to find it out for yourself! This new split testing feature will make uncovering that answer much easier. You should absolutely split test website conversion vs. link click optimization. This one is often a mystery, and it’s especially important to test out when the volume of conversions you get on your pixel is in the “tweener” stage for effective optimization. But you should also consider testing Daily Unique Reach or even impressions when given the right situations (extremely relevant audience). Speaking of mysteries, you should test Facebook’s new options for optimization windows. It would seem logical that you should use 1 day windows for conversions that typically happen within a day and 7 days for those that take more time, but you know what? I really have no idea. Test them! And while I typically use automatic bidding, many advertisers swear by manual bidding. Not only can you compare manual vs. automatic, but you could compare two or three different manual bids to see what works best! Have you started using the new split testing feature yet? What do you think? What types of results are you seeing?